Profits at Mike Ashley’s private company dropped in 2017 when Sports Direct was hit by the fall in the value of the pound and Newcastle United’s revenue slumped. Mash Holdings’ accounts for the financial year to end-April 2017, show profits fell to £102.5m from £227.7m. 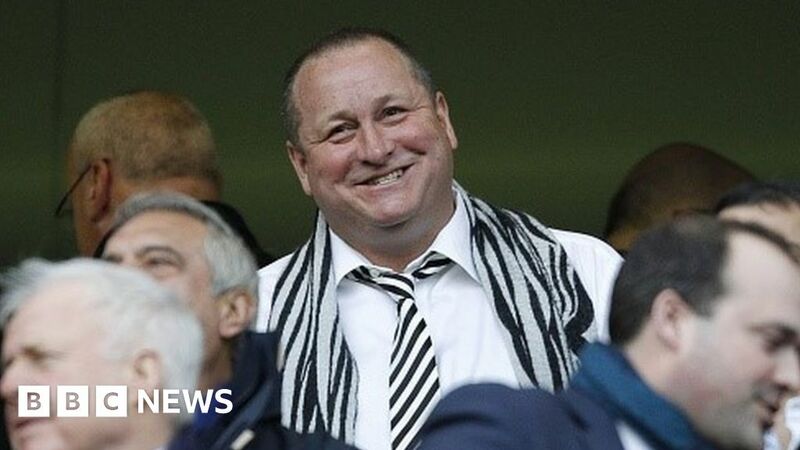 They show the Sports Direct founder is still seeking a buyer for Newcastle United, which he has owned since 2007. The cost of using the company jet and helicopter is put at £700,000. Matchday hospitality for his family is valued at £78,000, down from £101,000 the previous year. Turnover at Newcastle United fell to £91.8m from £131.1m while operating expenses increased by £44.3.m to £140.8m. Loans to the club from Mr Ashley were £144m and the accounts state that “in October 2017, owner Mike Ashley decided to put the club up for sale”. “The club will have challenges to face as it looks forward to the 2018/19 season back in the Premier League,” the accounts add. Some land next to the club has been sold for £9m. Sports Direct, which is listed on the stock market, has already published results for the period covered in Mash Holding’s accounts, which described the “currency headwinds” and “strategic challenges” in continental Europe as impacting performance. The leisure retailer has traded “in line with management expectations” since the end of April 2017. For the 12 months covered by the Mash Holdings accounts, revenue rose by 11.7% to £3.2bn but margins were hit by the fall in the pound following the EU referendum and an increase in provisions for stock no longer in fashion in a “fast changing market and supply chain”. Mash Holdings also said Sports Direct can get access to loans of up to £907.5m which could go up to £1bn. The business has also taken over House of Fraser for £90m and bought Evans Cycles for £8m. Mr Ashley has also failed to take over music retailer HMV and pulled out of the bidding for Patisserie Valerie. “The Group continues to seek out profitable investments and development projects,” the accounts, which list more than 400 subsidiaries, said. They also discuss family connections. In 2017 Sports Direct shareholders rejected a proposed £11m payment to the Mr Ashley’s brother, John, and these accounts say that the contract with his business Barlin is “no longer in place”. But a business controlled by Michael Murray, the fiance of one of Mr Ashley’s daughters, continues to provide “property consultancy services” to Sports Direct. The accounts also show that the company has looked at the role of Justin Barnes, a director of ISBL Consultancy which has a “commercial relationship” with Sports Direct. This was deemed to be an “advisory capacity” role and not one involving any management function, the accounts state. December 4, 2018 Comments Off on Can a brand create a ‘sonic identity’ from light bulbs?